Call 1-800-616-8808 or 706-529-8808 to request a quote for custom sizes, shapes, and quantities! Pet-friendly, slip-resistant carpet stair treads from Dean Flooring Company can make your home safer and more attractive. We carry rugs, runners and mats for stairs to help prevent people and pets from losing their footing on slippery staircases. Dean Flooring Company's stylish, affordable and easy-to-install slip-resistant pads for stairs are an especially popular choice for homes with pets, kids and elderly residents. At Dean Flooring Company, we offer the widest selection of carpet stair treads available anywhere, including options that meet any budget for any home. From our most economical treads to premium New Zealand wool carpet stair treads, you'll find what you need here. Custom sizes, shapes and quantities are available; just ask, because we can do anything when it comes to protecting and decorating your stairs. Options include classic rectangular stair treads as well as unique hexagon, oval and bullnose styles that will perfectly complement your stairway without completely covering your flooring. Protecting your family, guests and pets from dangerous slips and falls is our primary concern. 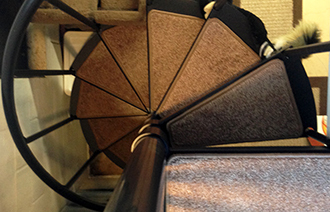 Our stair treads are an affordable, do-it-yourself alternative to traditional stair runners. Most people find that installation is incredibly easy, too. Dean Flooring Company's exclusive tape-free, pet-friendly stair treads don't require any adhesives, tapes or staples. Simply place them on your stairs for instant safety improvement that can help prevent a potential injury. We also carry coordinating carpet runners, landing mats and area rugs to complement many of the non-slip carpet stair treads we offer. You can choose the exact accessories you need to create a uniform décor theme throughout your home. Our décor options are truly limitless. Here you'll find stylish contemporary stair treads to complement your urban, industrial or avant-garde space as well as luxurious traditional stair treads that are ideal for any formal living space. We also supply high-quality outdoor carpet treads that can be placed at the threshold of your home to elicit beauty and add safety. These attachable carpet stair treads are made from all-weather materials so that they hold up well to regular exposure to sun, rain and moisture. Ideal for commercial and residential stairways, our 100 percent hi-UV stabilized polypropylene stair treads are easy to clean and offer the same simple installation as out indoor styles. All of our Dean Flooring Company carpet stair treads are proudly made in the U.S. from the finest materials. We ship directly from our facility in Dalton, Georgia, and we will begin processing your order as soon as we receive it. We look forward to providing you with our renowned customer service and our 100 percent satisfaction guarantee. We make custom sizes and shapes for spiral staircases and corners stairs. Is your dog having difficulty traveling the stairs? If so, we have the solution, non-slip carpet stair treads from Dean Flooring Company. How do my carpet stair treads stay in place without moving? I want to make sure my stairs are safe but I don't want to damage my flooring either. No problem. Our tape free pet friendly carpet stair treads have a proprietary non-skid backing that holds them in place. It does not require any adhesive or staples and it will not damage your stairs. Just place them on your stairs and go. Or you can us our peel and stick backing or double-sided carpet tape or our special double-sided mesh tape (recommended). The mesh tape will not leave a residue, holds great, and is easy to remove.